Get your Kansas insurance license using an America’s Professor online training course. Our comprehensive video lectures, review questions and study guide will help you learn, and retain, the material needed to pass your Kansas insurance license exam the first time! Includes Allied Lines study material. Bail Bond Only students are required to pass the Kansas Laws and Regulations exam. This course works as preparation for that exam (12-KS-07). This program was the perfect course for someone who knows nothing about the insurance industry. After completing the course, I studied hard and passed the test the first time. Everyone I spoke with at American Professor or emailed with any questions (Annie) quickly responded and were so nice! Passed the exams (Property & Casualty and Life) the first time. The courses are great and the instructor is absolutely delightful. I highly recommend America's Professor. With the help of America's Professor, I was able to start from absolutely nothing to being able to pass the Property and Casualty exam with a high score with only two weeks of studying! I feel like this course is so amazing and the practice quizzes and questions made a huge difference in my understanding of the material! Thank you so much for all your help. This site helped so much that I also decided to begin my Life and Health course with America's Professor as well! The only way this course could be better is if Jack was a tall buxom beauty with a low-cut dress! AP People pass and they pass the first time. Listen to the lectures, follow along in the guide and take the review exams multiple times. You do this, you will pass! Thank you so much! I took Property and Casualty, I was on the verge of loosing my job because I fail horribly twice and I passed after I bought America's Professor and literally I got it off google. Thank you so much!! I wish AP would have been my first choice. I used ExamFx and it just didn't break things down in the way Jack did which is probably the reason why I failed the test. However, after using AP and taking the test yesterday, well I passed!!! Thank you Jack and AP. I will always recommend you guys to another. Jack is "one of those" teachers. He's pleasant to listen to and engages you as he distills the material into understandable language. He almost forces you to have a good time. I could hear his voice in my head as I read the book. All in all, these courses are a great value and you really learn what you need and understand it. I passed with flying colors and never felt like I "studied." After failing my exam twice, and seeing so many courses online I didn't know where to go. I came across America's Professor and I'm happy I did! I dedicated myself to the course for about 2 weeks and I got an 89% on my exam!!! I honestly didn't think I was going to pass, because they try to throw you off with some weird questions. Thank you to everyone on America's Professor and especially to Professor Jack Morton!! Will definitely recommend to everyone I know!! Excellent program that allowed me to self-study at my own pace. I could pause lectures, review them in their entirety, whatever I needed to do. Study guide and practice tests also prepared me well for the exam. I passed! Thank you. Would definitely recommend this program for its "plain English" approach! Passed the Kansas exam just yesterday. Thanks to both the reading material, and lecture videos it made taking the exam a breeze. I liked the review questions at the end of each chapter it really helped me get better prepared for the exam. Highly recommend this program! This course is an amazing course. I have completed 80% of the course and took my state exam today and passed. Thank you so much. Please also check our frequently asked questions about the Kansas Insurance Licensing Exam. There are simply no shortcuts to preparing for your insurance licensing exam—you must know the material. America’s Professor makes it easier to pass on your first try. Our comprehensive pre-licensing courses include a well-designed, easy-to-use textbook and better-than-live video lectures featuring Professor Jack Morton, a business law professor who has been teaching insurance exam prep courses for 30 years. Professor Morton uses humorous stories and straightforward examples to help you understand and remember the material come test day. It’s this engaging approach to teaching that has made America’s Professor a leader in insurance exam prep—a fact that is reflected in reviews and testimonials from our students. Prepare: While the Kansas Insurance Department doesn’t require you to complete a pre-licensing course before taking the insurance exam, taking an insurance exam prep course will greatly improve your chances of passing, and, more importantly, passing the first time. America’s Professor courses include 24/7 access to engaging video lectures, a comprehensive hard copy textbook with free shipping, sample questions and practice exams, first-class customer service, and free extensions until you pass. Pass: Like all 50 states, Kansas requires you to be licensed to sell insurance or even discuss insurance transactions. Whether you want to sell or discuss life insurance, health insurance, auto insurance, homeowner’s insurance, accident insurance, or another product, you must be licensed. Each state, including Kansas, has its own laws regarding insurance—this is why there is both a “state rules” section and a “national” section on the insurance licensing exam. America’s Professor will help you prepare for both. Apply: Once you’ve passed your exam, you can formally apply for your insurance license and begin selling or discussing insurance! You will need a score of 70 on both parts of the exam—the national section and the state section—to pass. The two scores are not averaged. Exams are scored on-site, so you will know right away whether you passed, but you will not be given information on which particular questions you got right or wrong. America’s Professor has compiled helpful information for Kansas test takers about the kinds of questions that appear on the exam, which tests are toughest, how the exams are administered, testing center locations, and much more. 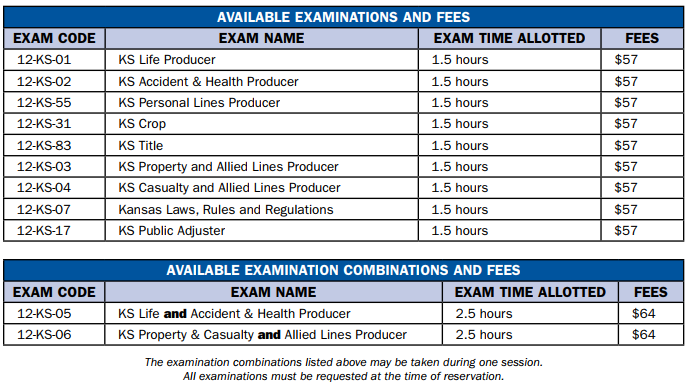 The charts below outline available exams in Kansas and exam fees. Exam Registration: In Kansas, Pearson Vue is the company that administers the insurance licensing exams. Call 1-888-204-6255 to register at least 3 days in advance of the date you want to take the exam to help ensure you get the test date of your choice. Testing Centers: There are several testing centers throughout Kansas. If you live near a state border, you may be able to take your exam in a neighboring state’s testing center. Find a test center near you here. Licensing Application Fees: The Kansas Insurance Department charges a $30 license fee for most license types, and licenses must be renewed annually. Fingerprinting: Kansas does not have a fingerprinting requirement, but, the licensing application will present several questions about your background. If you answer these questions affirmatively, an additional process will be necessary. Enroll in a comprehensive insurance exam prep course through America’s Professor today and be on your way to launching or expanding your career in the lucrative insurance industry!